Fun black and white cow singalong video with quality 3D animation! This version of Black and White Cow has the lyrics of the song across the screen – singalong style – and the words match the song and video. 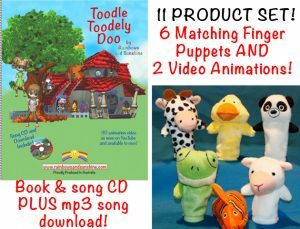 This makes it easy and fun for parents to sing along with their children and ideal for children who can or are starting to read! It’s entertaining and educational at the same time. There are also lots of useful ideas for using the video, song and matching book – included under our “Tips and Ideas” menu. It’s great to use this song to encourage memory skills with your children – the song is cumulative and perfect for cognitive development! The central character in the video is an appealing cow who faces many challenges in her life. But she remains a happy and contented cow, despite the fact that by the end of the song she is a soggy, smelly, sneezy, ringing, swishy, noisy, dirty, munchy, itchy black and white cow! If you prefer to play the video without the singalong lyrics on the screen, our original version is also available ($3.90), and the song by itself is also available as an mp3 download ($1.99). This means that you can play it free of advertisements and offline anytime. Some of the inside pages of the matching book (which has the song CD and mp3 song download included), available for $24.90, are shown below…. 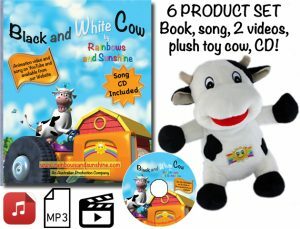 An adorable soft plush toy cow completes the set of book, song and 2 videos….. available as a “6 Product Set” for $49.90.